Consisting of colourful panels of photographs, posters and charts, the Exhibition depicts the structure and activities of the United Nations. Each Member nation is represented by a large photomontage and flag. Opened on 15 September, the Exhibition, after 9 weeks in Brooklyn, will tour the United States. Special editions in French, Spanish and English will be shown in Member countries. 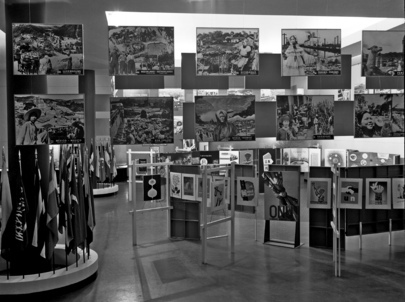 Partial view of "Know Your United Nations" Exhibition at the Brooklyn Museum, designed by Visual Information Section, United Nations Department of Public Information. 1 October 1947.